What is Friends & Foes and why should we back it? 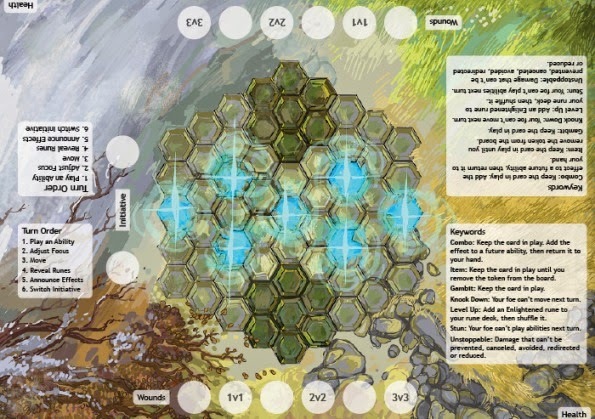 Friends and Foes is a fantasy team brawler board game guided by modern game design principles. If you think that thematic fantasy combat governed by elegant rules featuring simultaneous turns, no player elimination, and less than one hour play time sounds like fun, you should back Friends & Foes so you can get a copy. I’m an independent game designer and the only way Friends & Foes can get made is with your support. Was the intention always to fund via Kickstarter or did you approach publishers first? I actually didn’t even know kickstarter existed when I started designing Friends & Foes. I realized that if I wanted to be a game designer, I should design games rather than apply to game design jobs. I was just creating the game I wanted to play, and when I showed it to my friends, they showed me kickstarter. At GAMA 2012 I got a whole lot of information about my various options for publishing the game. It became clear that self-publishing would be the ideal way for me to get this game out to people. I want to thank Dean Kao of Eudemonia in Berkeley for taking me to GAMA! What was the inspiration behind Friends & Foes? Dungeon’s & Dragons was the inspiration for Friends & Foes. I wanted to play a fantasy combat game, where the game mechanics were as compelling as a game like Settlers of Catan or Dominion. As I developed the game I discovered its strengths and weaknesses. Friends & Foes emphasizes teamwork, competition, and interesting choices. Those interesting choices come with some increased complexity, so D&D does some things better than Friends & Foes, like weaving seamlessly into a story. F&F now shares more in common with DOTA and League of Legends than it does with D&D – it’s more like a MOBA as a board game than it is like an RPG combat system. Making a MOBA board game has been the goal of designers for some time, how have you managed to translate elements from DOTA and League of Legends into Friends and Foes? Great question! I think that this game brings two key board game innovations to translating a MOBA into a board game. One is simultaneous turns. Choosing your abilities simultaneously, and having every character move before any characters deal damage, really gives you the feeling that everything is happening at the same time. The second innovation is the wound system, that keeps anyone from getting eliminated. Players don’t get eliminated from MOBAs, they just have a respawn timer. Many of the elements of a MOBA that were translated into a board game had to be simplified dramatically. For example, stuns always last the same amount of time, one turn, as opposed to anywhere from 0.5 to 2.5 seconds in a MOBA. The armor mechanic is also used by only one character rather than being a facet of every character. Isolating certain mechanics to specific characters was a great tool for including lots of elements of MOBAs while limiting the complexity of the game. The Assassin’s stealth is incredibly powerful, and is the only character that can use it. Lots of the abilities were inspired by MOBA abilities too. Whip Cord for example is similar to Blitzcrank’s Rocket Grab or Pudge’s Meat Hook. In this game though Whip Cord is used by the Assassin and can be used to pull an enemy toward your allied melee characters, or in combination with stealth to pull a melee character away from a ranged ally. At first glance Friends & Foes bears more than a passing resemblance to Galactic Arena. Were you aware of Galactic Arena and how does Friends & Foes differ? I wasn’t aware of Galactic Arena; I started designing Friends & Foes back in 2011. I think what’s interesting about the resemblance is that it shows a rising interest in this kind of game. I think people want a game that gives them the feeling of an RPG but can be played in under an hour. After watching the GreyElephant video for Galactic Arena the two biggest differences are the game mechanics and the theme. 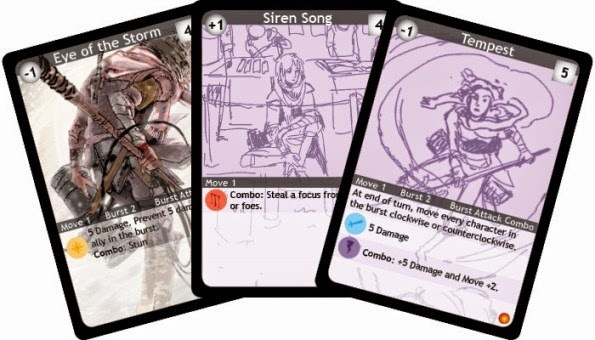 Friends & Foes features simultaneous turns; at the beginning of each turn every player simultaneously plays an ability card face down. This helps to keep the game moving forward because it makes the game less “chessy.” What I mean by “chessy” is having lots of open information you have to analyze before making your play. Friends & Foes also features no player elimination. When you deal damage equal to a character’s health, that character’s team gets a wound. When you’ve dealt enough wounds, you win the game. There are also no dice in Friends & Foes. Friends & Foes also has an immersive fantasy theme. The Assassin begins the first turn off the board and can be placed anywhere to represent stealth (and can use Vanish to do it again). The Berserker gains rage when attacked, the Enforcer has heavy armor that absorbs attacks, and the Duelist sets up disadvantages on his foes to trip, parry and disarm them. The Fire Archer sets traps and can set parts of the battlefield on fire, the Storm Caller can teleport, and the Warden can mind control people. Each character feels very different to play because of the way their abilities support the theme. It sounds like there is a large variation in character abilities, was it difficult balancing all the various skills and abilities? Yes, very difficult! None of the original 64 abilities made it through development unchanged. The biggest challenge was making all the options within one character appealing. For example, the Enforcer used to have an “Intercept” ability. It wasn’t overpowered, but it still made many of the Enforcer’s other tools for keeping her enemies away from her allies obsolete. Removing that ability made her knock downs and other battlefield control abilities far more appealing. Another example is that Vanish used to be a +1 Focus ability. That led to a situation where you always had plenty of focus as an Assassin, so you always skipped -1 Focus abilities and went straight for the -3 Focus abilities every couple turns. By making Vanish slightly more powerful, but not provide focus, all the other Assassin abilities opened up and became appealing. Friends & Foes has a very distinctive art style, how did you go about finding your artist? I got really lucky with K. Linney. At first I was going to work with Magic: The Gathering artists like rk post and Jim Pavelec. I’m sure these professional artists would have done an excellent job, but I realized that I didn’t want the game to look like Magic, or like D&D. I wanted it to look like Friends & Foes. Then I was introduced to K, a high school classmate of my sister in law. K’s distinctive style was exactly what I was looking for. As someone at the beginning of their art career this project is very mutually beneficial for both of us. I honestly can’t pick. I know that the artist’s favorite character is the Warden, and I think my favorite art is for the Enforcer. There was this point at which, without noticing, I had put so much work into differentiating the characters that each character almost felt like playing a different game. I think that when I realized that, it became impossible for me to choose one favorite character to play. A big thank you to Wyll for answering my questions. There are still a few more days to back Friends and Foes on Kickstarter.